AcctVantage ERP User ManualsAcctVantage ERP User ManualsAccounts Receivable Receiving Payments and entering Bank DepositsReceive a Payment from a Customer. After you have taken a customer's order, fulfilled the order and sent an invoice, the next step in the AR process is to receive a payment from your customer. This lesson will describe how to enter a standard Receipt in the form of a check. Check out this article if you need to enter a Receipt from a method other than a check. Click the Create New Record button or use the keyboard shortcut Command + N.
3. Enter a new Receipt. Client Information: Enter the Client Name here. Terms, Client Number and Address will auto-populate. Invoice Number: (Optional) This can be used to quickly find the correct Client record. This can be helpful if you have several Clients with the same name. Note this field is not used to indicate which invoice is being paid, you'll do that in step 4 below. Receipt Information: All fields are mandatory except for Memo. Amount is the total amount of the check. Date is the date the check was received. Receipt Type: In this article we are just using the standard Cash - Checking Receipt Type. If you were accounting for a Credit Card, Wire Transfer or other type of Receipt, this is where you would select the relevant option. 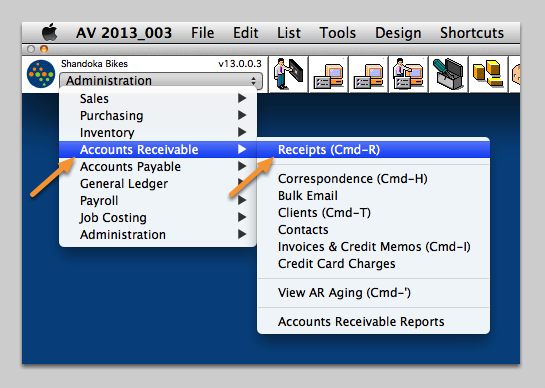 Line Items: In this bottom section you will select which of the invoices are being paid on the A/R tab. 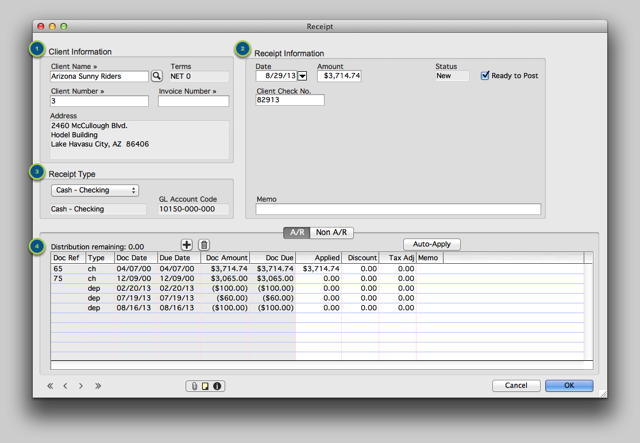 If you click Auto-Apply the total Receipt Amount will be applied to invoices in order of oldest to newest. 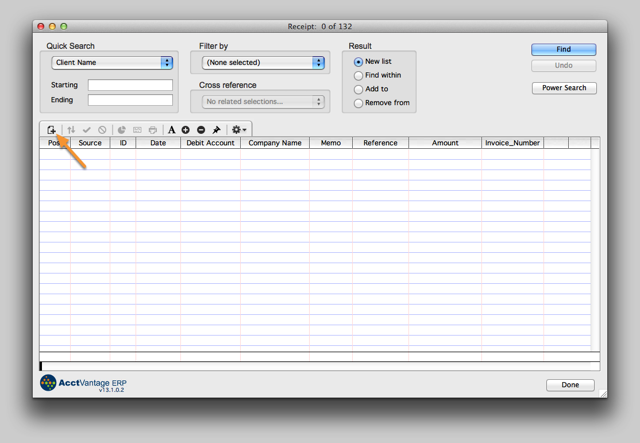 You always have the optoin to manually apply the Receipt Amount to invoices using the Applied column. If your customer took an A/R discount use the Discount column or if there are any tax adjustments to apply use the Tax Adj column. Distribution remaining - This should equal $0.00 when you are finished applying the Receipt. Click OK to save the Receipt and don't forget to Post! Receiving payment from somebody that's not an established Client, or for something other than an AR Invoice? See this lesson. Zoom: Enter a new Receipt.